I have been a fan of Lori Foster for as long as I can remember. I have literally gone through every single book she has published. I have even read most of her reissued novels. For some reason I cannot get enough of her stories! Something about the way she writes them draws me in.. This novel is about opposites attract and to me, there is no better story! Adding this to your TBR list? A Fan of Lori Foster? This book looks really good--I'm not a big contemporary fan though! Hopefully you love it. I LOVE Lori Foster! She normally does Romantic Suspense, but I think she will rock at this as well! I have been eyeing this author's work for a while...it looks like I should start reading her. Thanks for sharing...and for visiting my blog. She is Uh-MAY-Zing! You should def give her a try! I love opposites-attract stories. I don't think I've actually read one of her books, so I'll have to give her a go. Thanks for stopping by my WOW! Ohh! You should def give her a try! What a more perfect novel than an opposites attract novel! OOh I still have yet to read anything by this author but I really want to and this one sounds great! Oh man! So many of you haven't read her yet! You should def pick one of her novels up! You really should! :) They are def worth the read. She has some very swoon worthy men! Awesome pick Peyton this is actually the first time I heard about this book. And it looks and sounds absolutely amazing and fantastic! Thank you for stopping by my WOW. I LOVE your pick, Peyton!! 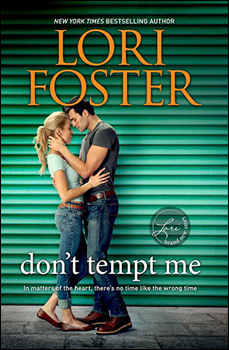 I've been meaning to read a Lori Foster book for the longest time now....and I might very well start off with this one! I've heard great things about her! This plot sounds very compelling! Thanks so much for the heads up, as I'm now adding it to my Goodreads shelves! I love Lori Foster! This one sounds adorable and I do love opposites-attract couples! Definitely excited for this (: Thanks for sharing!